Anger is the emotional alarm, triggered in our nervous system, which is activated when we (rightly or wrongly) perceive something is unjust, or that some violation of our rights has occurred. Like other emotions, anger is experienced in our bodies as well as in our minds. There is a complex series of physiological (body) events that occurs as we become angry. In our body we feel this physically activation in the form of tension in our chest and throat and this feeling can radiate to our shoulders, our back and into our neck and jaw, and cause headaches. It can affect our breathing and cause a feeling of agitation. All emotions are a call to action. Evolutionary speaking, anger is an emotion designed to change the behaviour of someone else. Anger is the emotion that calls to action “attack”, and is experienced as an up-rush in energy, designed to facilitate a favourable outcome (behaviour change in the other – you get your belonging back, or there is atonement for wrongdoing). The outcome of this emotional charge leads to mood change. When the outcome of anger is positive (i.e. ; justice is served, wrongs righted) there is an elevation in mood. However if the circumstances are unpropitious, and the anger is inhibited or expressed anger leads to an unfavourable outcome, there is a depression of mood resulting in feeling bad, unworthy and helpless. There is truth in the old adage that psychoanalysts have stated for many years, “depression is anger turned inward” (anger not acknowledged or expressed). Anger expects to be expressed, and ideally in a relationship (open to change), we do this through assertive communication. However, many situations and relationships do not do not invite transparent and open relating and can sometimes cause us more anger when our overtures to be assertive are denied, dismissed or challenged. In these cases anger still needs to be discharged (let out/moved), but in a responsible way that helps us meet the demands of the primitive part of our brain (1 & 2), but without hurting ourselves, others or property. 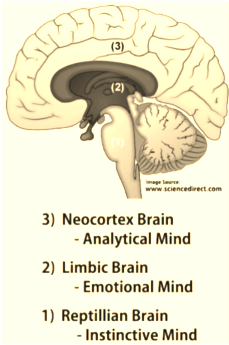 We can use our noecortex ( 3 ) to activate anger by expressing our anger through writing or speaking out loud to the air, and then use the symbolic venting exercises to trick the brain into thinking the challenge was conquered, so the alarm can be turned off. Begin with addressing your writing directly to the person (or thing) concerned “Dave”, “Redundancy” etc. Focus on one person/thing at a time. Express as honestly as you can to release angry thoughts. Express the thing you FEEL in DETAIL and the IMPACT of behaviour/events upon you (rather than a factual record). IF you write…. these writings are intensely private. All material should be disposed of carefully and responsibly; there is no benefit in keeping it. If writing is directed at a specific person, it should never be sent to the recipient. If the urge to share is strong – write the urge down too. Then “Speak” the feelings to your pillow and destroy your writing. The point of the exercise is to VENT in order to move anger through your nervous system, so that it is not stuck there in your body. Writing or speaking out loud will activate anger. Choose a safe strategy to physically vent, by punching a pillow in the middle of a bed; use a pillow to hit the bed; strangle the pillow. If you are able to, yell at or into the pillow, Pacing whilst yelling into the air, helps with the feelings of agitation. Prepare other house occupants for the angry noises by educating them about the process, and warning them when you retire to the room to work, or choose times when no-one is home. Once anger is released safely, you will be in a better position to think about how better to handle the person/circumstance, or you may be ready to let go and move on. REST if you are tired, or go for a gentle walk. Teaching your children to safely release frustration can equip them with their own skill and understanding that you are taking responsibility for your own feelings – which is good role-modelling. After your anger work, always come out and report to your children in a calm state “that feels better”, so that they see you returning to a normal calm mood. Encourage them to get their “angries” our safely too and then talk to them about their experience. The primary emotions are anger, fear, pleasure, sadness, and disgust. Emotions can be conceptualized in terms of their functional or adaptive (help us survive) significance. Negative emotions such as anger and fear may promote avoidance or defensive behavior whereas the positive emotion of pleasure may facilitate ingestive, exploratory, sexual, or novel-seeking behavior. Thus, emotions and feelings may serve to achieve homeostasis or to facilitate adaptive behavior and equilibrium.